Following the near-record civilian death toll tracked in June, a significant reduction in likely fatalities from Coalition air and artillery strikes in Iraq and Syria was seen in July. Testament to how high casualties have been in recent months, July was still the fourth most lethal for non-combatants since the start of Coalition actions in August 2014. Ordinary Iraqis and Syrians on the ground remained in grave danger. During July, Airwars tracked 195 civilian casualty events in Iraq and Syria, likely killing between 347 and 524 civilians – a 37% decrease on June’s minimum estimated totals. The full capture of Mosul from ISIS led to air and artillery strikes in the city effectively stopping after July 18th. As a result, there was a 41% fall in incidents of concern in Iraq, including a decrease in both likely and contested civilian casualties in Mosul. This reduction came too late for thousands of civilians, and in the weeks since the city’s capture, the true extent of suffering and death from the eight month campaign has begun to emerge. In Syria, Airwars researchers tracked 175 civilian casualty events – just 6% less than the all-time-high seen in June. This represented 90% of all incidents in both Iraq and Syria during July. However, likely civilian deaths from Coalition actions in Syria still fell by 29% compared to June. According to Airwars’ current assessments, between 294 and 456 non-combatants were likely killed in Syria during July. The majority of these incidents took place in Raqqa, where the SDF made slow but important gains amid fierce resistance from ISIS and heavy air support from the Coalition. A 32% decrease in munitions fired in Raqqa also saw likely civilian deaths fall by 33% in the governorate. Meanwhile, July saw a 41% rise in casualty events allegedly perpetrated by the Russian Air Force in Syria, where 65 incidents were tracked during the month. The majority of these events occurred in Deir Ezzor and Raqqa governorates. Yet despite this escalation in Russian actions, there were still three times as many casualty events attributed to the Coalition in Iraq and Syria as there were to Russia in Syria. This is now the seventh consecutive month that Moscow’s own bombing campaign has been overshadowed by casualty events reportedly the responsibility of the US and its allies. As of July 31st 2017 some 13,273 air and artillery strikes had reportedly been carried out in Iraq – and 10,924 in Syria – since the start of the Coalition campaign against so-called Islamic State nearly three years earlier. In Iraq, there was a marginal decrease of 2% from June, with 224 strikes declared. Strikes in Syria, however, continued to increase from June’s already high levels. A total of 953 strikes were declared throughout July in Syria – 9% more than the month before. According to official data published by US Air Force Central Command, the Coalition’s declared active members (the US, UK, France, Belgium, Australia and Jordan – along with possibly Saudi Arabia and the UAE) released a total of 4,313 munitions during raids on ISIS targets in July. This was an 11% decrease from June’s record munition figures, but still represented the third highest number of munitions fired in any month of Coalition operations. Separate munitions data provided to Airwars by the Coalition are higher than those published by AFCENT, because they also include HIMARS rockets, helicopter attacks, US Army strikes and artillery strikes. According to CENTCOM, the Coalition fired approximately 13,193 munitions between Iraq and Syria during July alone – some 2,142 in Iraq and 11,051 in Syria. Following the liberation of all but the last pockets of ISIS resistance in Mosul by early July, there was a 73% reduction in the number of munitions fired in the city during the month – with approximately 1,113 bombs and missiles released on the city. In the wake of Mosul’s capture, reported actions by the US’s two most active allies in Iraq – the UK and France – fell considerably there. In the four week period from June 26th to July 31st, the UK declared 23 strikes in Iraq, a drop of 34% on the previous four week period. French actions in Iraq fell by 59% to 11 airstrikes, while artillery strikes by Task Force Wagram fell by 63% – with 63 strikes declared in July. In July, the Coalition informed Airwars that approximately 3,012 bombs and missiles were fired in Raqqa – a 32% decrease over June’s record tally of 4,400 munitions. As reported in more detail below, likely deaths in the governorate from Coalition air and artillery strikes fell by 32% – nearly the same amount. On July 1st, the Iraqi army completely surrounded ISIS in its last strongholds in Old Mosul, seizing control of the last bridge over the Tigris river – and ISIS’s only escape route. On July 4th it was reported that Iraq was to declare the full liberation of Mosul within two days, and that the Iraqi army’s 9th armoured division would then advance to Tal Afar. The humanitarian situation, however, remained catastrophic, with the UN warning that 20,000 civilians remained trapped in ISIS’s last pockets within the city, where they remained in “extreme danger from bombardment, artillery crossfire,” according to Lise Grande, the UN’s humanitarian coordinator in the country. On July 11th, the Coalition officially announced the liberation of Mosul from ISIS, but said that some areas of the Old City still needed to be cleared of explosives and potential ISIS holdouts. Yet even after complete victory was declared, sporadic clashes continued in parts of the Old City, including suicide attacks launched by remaining ISIS fighters on July 20th. Meanwhile in Raqqa, Syrian Democratic Forces (the SDF) announced that they had breached the old city of Raqqa on July 4th by opening two gaps in the ancient Rafiqah Wall which surrounds the city. The Coalition confirmed that it was responsible for the breaches. As the month wore on the SDF made further advances, seizing control of 35% of the city’s area by July 12th. But heavy counter-attacks persisted. CJTFOIR commander Stephen J Townsend said that ISIS fighters must “surrender or be killed“. 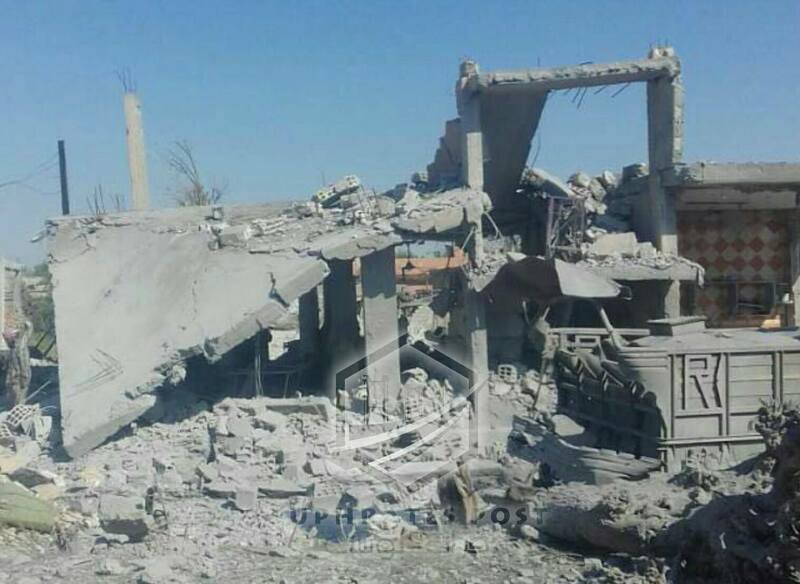 On July 18th, it was claimed that the SDF had slowed the tempo of its advance in the eastern front of Raqqa city to stem mounting civilian and SDF casualties and safeguard important historic sites. 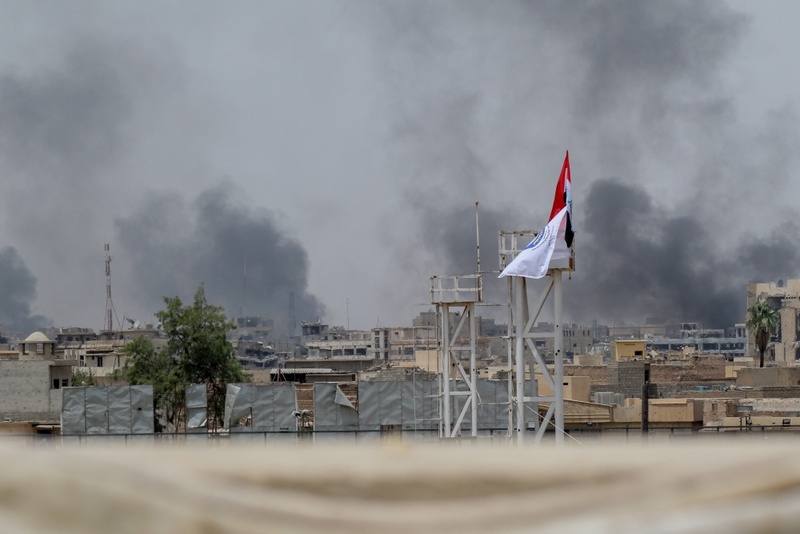 Despite sustained counter-attacks and fierce battles, by July 27th – the 50th day of operations – the SDF reported that it had now seized 50% of the city. Likely civilian deaths in Iraq and Syria due to Coalition strikes fell 37% in July, but it was still the fourth worst month for civilians since the start of Coalition actions in 2014. Overall, across Iraq and Syria Airwars tracked 195 casualty events – a 14% drop from an all time record of 228 incidents tracked during June. Of these 195 events, Airwars currently assesses 92 as being fairly reported. This categorization means that an incident has two or more uncontested sources, and that the Coalition has confirmed carrying out strikes on the same date in the near vicinity of the reports. Airwars’ current assessment is that between 347 and 524 civilians were killed in these events – compared to a minimum of 548 deaths in June. The raw overall alleged toll from Coalition actions during July in Iraq and Syria – across all incidents assessed as ‘fair’, ‘poor’ or ‘contested’ – currently stands at between 1,572 and 1,934 fatalities. While likely deaths had fallen since June, they remained extremely high. July is also now the seventh straight month that casualty events attributed to the US-led Coalition in Iraq and Syria have outpaced those reportedly linked to Russia in Syria. Our researchers tracked three times as many Coalition as Russian events during the month – though unlike the Coalition events, these Russian incidents have yet to undergo a full assessment. In Iraq, fatalities dropped precipitously after ISIS control of small areas on the city’s western bank was finally ended. In July, Airwars tracked 20 civilian casualty events across Iraq – a 41% drop on the previous monhth. Of these 20 events, 65% were located in Mosul. As fighting ceased and ISIS were driven out of the last pockets of the city, the number of contested events fell by 53% on June. Across all categories – ‘fair’, ‘weak’ and ‘contested’ – between 796 and 810 civilians were claimed killed by the Coalition in the city during July – compared to an estimated range of 874 to 1,167 deaths in June. The fall of Mosul to Coalition and Iraqi forces also led to a 54% decrease in Coalition air and artillery strikes on the city during July. Just 60 strikes were declared during the month, and from July 18th no further strikes were reported in the city by the Coalition. The number of targets reported bombed in the city – a far more reliable indicator of the intensity of the campaign – also fell by 48% compared to June, to 689. And munitions fired on the city fell to 3,012, a 72% drop according to the Coalition. 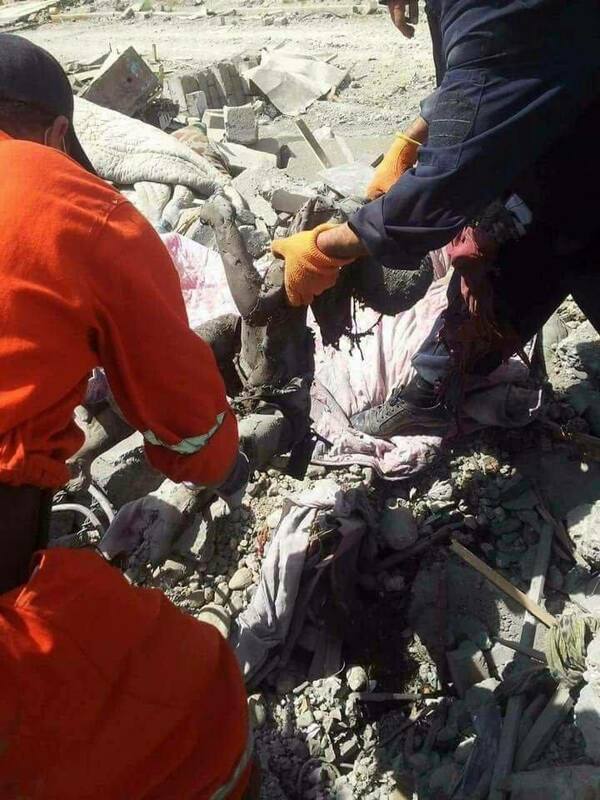 Of the three Mosul events assessed as likely carried out by Coalition aircraft, the worst occurred on July 1st when multiple local sources reported the death of an entire famiy of nine in Old Mosul’s Nabi Jarjis area. 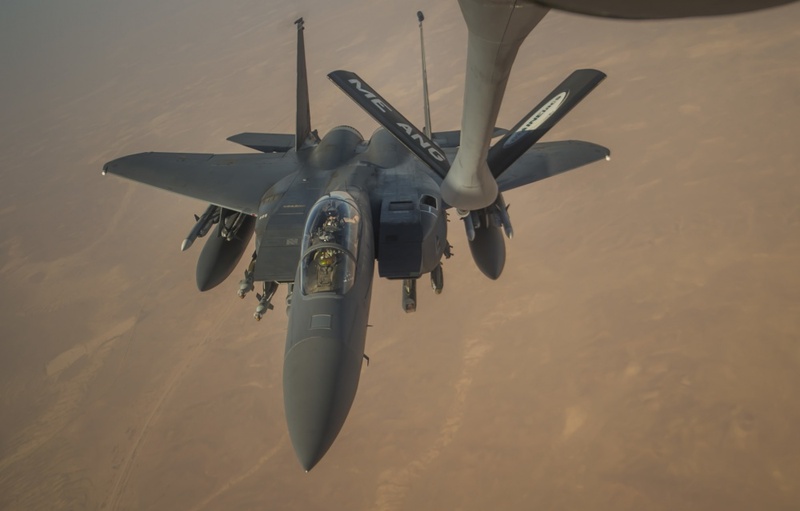 While sources didn’t say who had carried the raids, a senior Coalition official had informed Airwars on July 5th that it had been “weeks” since the Iraqi air force had carried out strikes in the city. Yaqein reported on the same date that more than 20 civilian bodies had been recovered from the rubble following “continuous shelling”. Throughout July the tragedies of West Mosul continued to emerge. On July 2nd in West Mosul’s Zanjili neighbourhood – scene of some of the highest casualties during the campaign – local medical sources and civil defense teams reported pulling up to 74 bodies form the rubble. Responsibility for the deaths was unclear. Yaqein blaming “the Joint Fores” without specifying whether this was the Coalition and/or Iraqi aircraft. Other medical sources, contacted by Airwars, said that many of the civilians had been shot by ISIS as they had attempted to flee the area. Chillingly, our researcher was informed that most of them had been women and children. But worse was to come. On July 7th, local sources reported that more than 1,000 civilians had been killed and wounded over a week-long period as a result of alleged Coalition airstrikes and Iraqi government bombardment in Old Mosul over recent days. Activist Ali al Hamdani told Al Araby that “death threatens thousands of civilians, while the bodies of others are still lying in the streets of liberated areas, some of which are buried in public squares and gardens.” Iraq News Center added that the the number of people buried under the rubble was now so high that civil defense teams had given up hope of recovering them. Between July 15th and 31st, there were only six further reported incidents of concern in Iraq. Four were in Anbar province, with the worst in the Al Qa’im district located on the Iraqi-Syrian border. On July 15th, 13 civilians were likely killed there in alleged Coalition airstrikes on residential areas which also killed eight ISIS fighters. On July 27th, a further 13 died in the district, again after the Coalition allegedly targeted homes in the area. 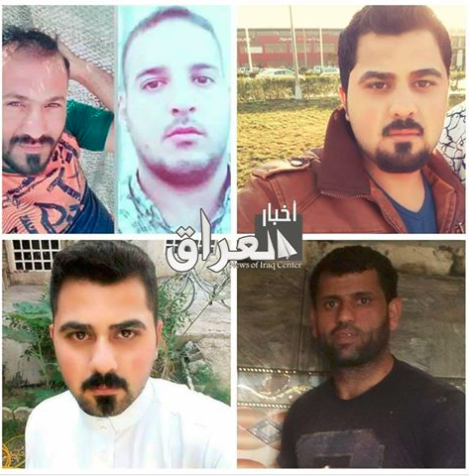 On July 27th, in Tarmiyah, north of Baghdad province, six civilians including Omar Jamil al-Sharmait, head of the Tarmiyah council, and his son, Ahmed Jamil Falih Hayali, died when an alleged Coalition strike hit Mr al-Sharmait’s home. According to NRT, a missile also hit “a group of young people in a cafe, killing two and wounding four others.” One source, Al Tarmiyah, reported that the group were playing dominoes when they were killed. Following record numbers of civilian casualties tracked a month earlier, in July Airwars researchers monitored a 29% decrease in deaths assessed as likely caused by the US-led Coalition in Syria. However, as the battle to seize the city of Raqqa from ISIS entered its second full month, civilians remained at extreme risk as intense fire from Coalition air and artillery strikes fell upon them. The volume of casualty events in Syria as a whole remained very high. Overall, researchers tracked 175 separate events – just 6% less than the number tracked during June. This amounts to 90% of all alleged Coalition events monitored across both Iraq and Syria over the course of the month. Of these 175 events, Airwars presently assesses 85 as likely carried out by the US-led Coalition. These incidents left between 294 and 456 civilians killed – 29% less than the minimum estimates for June. This significant decrease in fatalities likely caused by the Coalition, however, was coupled with a 56% rise in events assessed as contested. A minimum of 132 civilians reportedly died in incidents which had conflicting accounts blaming the Coalition, the SDF and/or the Assad regime. This matched recent experiences at both Aleppo and Mosul, where the qwuality of local reporting broke down as fighting intensified. As in June, the vast majority (86%) of all events assessed as ‘fair’ in Syria occurred in Raqqa governorate. Across 73 such casualty events, between 229 and 314 civilians likely died – a 33% decrease on the minimum of 340 civilians killed in during June. As previously reported by Airwars, children paid a particularly lethal price as the fight moved deep into the city. At least 57 children died during July in Raqqa, as well as a minimum of 29 women. Once again, the most vulnerable members of society were at extraordinary risk. Official Coalition data for July shows that the intensity of the Raqqa campaign remained at a similar level to June. There were 699 air and artillery strikes declared in the governorate – a relatively small increase of 9% on June. The number of targets bombed remained at roughly the same levels, decreasing by one percent to 1,454. Munitions figures from the Coalition, however, indicate a decrease in the intensity of bombing. Overall, approximately 3,012 munitions were fired in support of operations to isolate Raqqa – a 32% fall on June. A 33% decrease in the civilian death toll in Raqqa governorate shows one of the strongest likely correlations between munition use and casualties yet seen. While many casualty events led to the deaths of one or two civilians, Airwars continued to track incidents in which entire families were wiped out. On July 2nd, local media reported that as many as 14 civilians, including multiple members of the al Nashif family, died in alleged Coalition air and artillery strikes on Raqqa’s Al Dar’iya neighbourhood near the al Safa mosque. Among the reported dead were Ahmed Hussein al Nashif and his three children, as well as Jamila Ali al Abdullah and her three children. As was frequently the case with events tracked in Syria, the allegations were extremely well sourced. In this case, Airwars tracked 18 separate reports which blamed the Coalition. 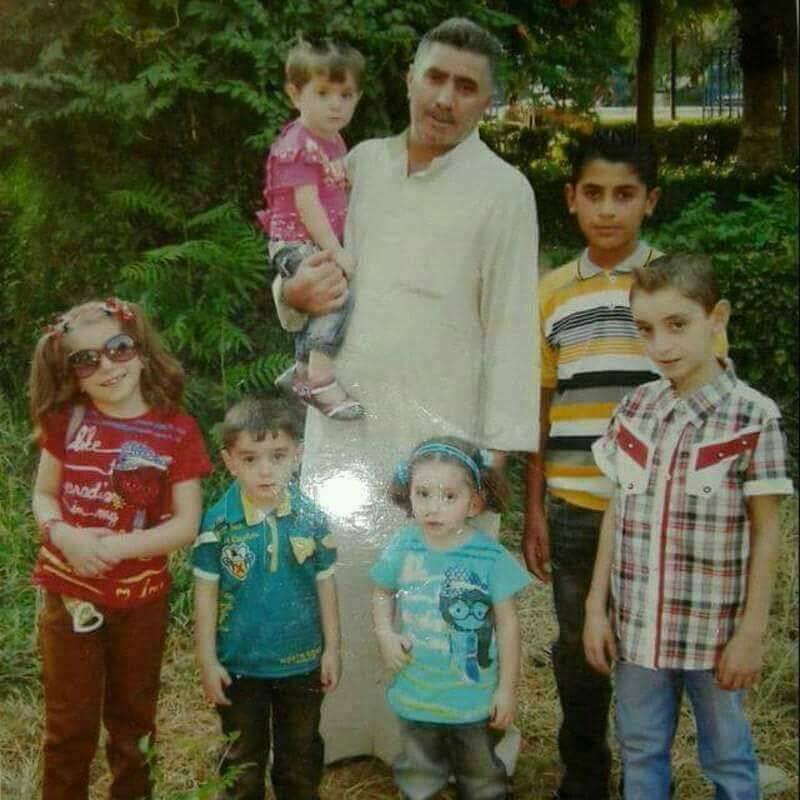 On July 17th, 15 members of the Salama family – including four children and three women – died in an alleged Coalition raid on the Hisham Bin Abd al Malek neighbourhood. Activist Ahmad al Shibi reported that the victims perished when engineer Marwan Al Salama’s home was struck. According to Raqqa.rwb, the event claimed civilians across several generations: “15 senior and young people”. In the final week of the month, on July 28th, a family of 15, including eight children and three women, were reported killed when their home was hit by an airstrike. All sources blamed the US-led Coalition, naming multiple members of the Al-Zana family as victims. 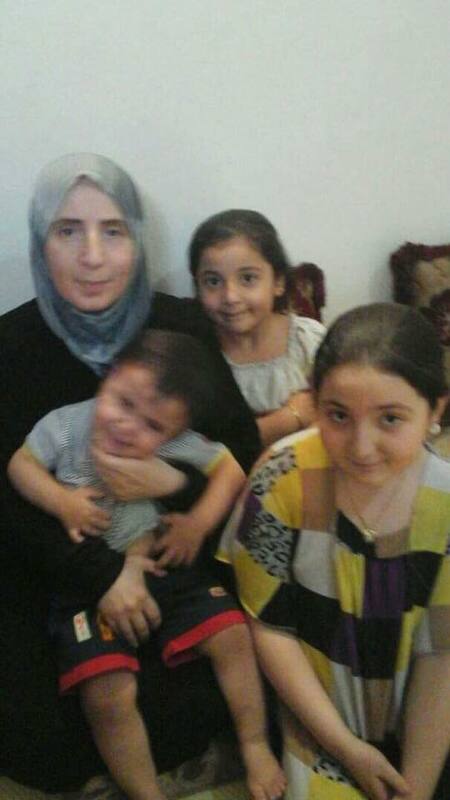 According to The Syrian Human Rights Committee, the family were displaced from Tadef in Aleppo. The story was all too familiar: the most vulnerable desperately fleeing, only to be struck down when they finally thought they may have found some kind of safety. Coalition strikes in Deir Ezzor governorate during July remained at a similar level as June, increasing marginally by 3% to 193. Fortunately for civilians, the month nevertheless saw a 39% fall in the number of casualty incidents likely carried out by the Coalition. Even so, a minimum of 57 civilians likely died across 11 events. Such general numbers began emerging in the final weeks of the month. On July 27th for example, local media reported that up to 48 civilians had died and 40 were injured by air and artillery strikes in Raqqa, though no specific locations were given. Likewise, multiple sources reported that as many as 99 non-combatants had been killed with approximately 120 injured between July 26th and 28th. However, most reports were carbon copies of one another, and Airwars has thus far been unable to break down these big number into specific areas and incidents. “These events are sometimes poorly reported with vague details of where the deaths occurred, and without named victims,” explains Haddad. “It is becoming clearer that the difficulty of access to the area is making it increasingly hard for information to come out,” she warns. Following a 25% decrease in civilian casualty events in June allegedly involving Russia in Syria, July saw claims rising once more. Throughout the month, Airwars tracked 65 alleged Russian incidents – an increase of 41%. Raw figures indicate that across these 65 events between 211 and 287 civilians were reported killed in alleged Russian actions. However it should be noted that these raw numbers are unvetted, and should therefore not be directly compared to Coalition estimates in this report. The majority of claimed Russian casualty events were reported in Deir Ezzor, Raqqa and Hama governorates. July saw a dramatic increase in events in Raqqa and Deir Ezzor, where the highest number of events so far tracked in 2017 were recorded. Reported casualty events in Deir Ezzor doubled to 26 incidents, for example. Worryingly, the number of contested Russia/ Coalition events also almost doubled, with at least 202 civilians reported killed in 25 such incidents. In July, there were three times as many alleged Coalition civilian casualty events in Iraq and Syria as there were incidents attributed to Moscow in Syria. This is now the seventh straight month in which the number of allegations against Russia has been outweighed by those against the Coalition. Airwars is registered in England and Wales as a not-for profit company limited by guarantee, company no. 10314448. Our registered address is: c/o Thompson Jenner LLP, 1 Colleton Crescent, Exeter, Devon EX2 4DG.